The Sai Pancharatna Kritis are special Carnatic compositions describing the life story and the glory of the Sathya Sai Avatar. 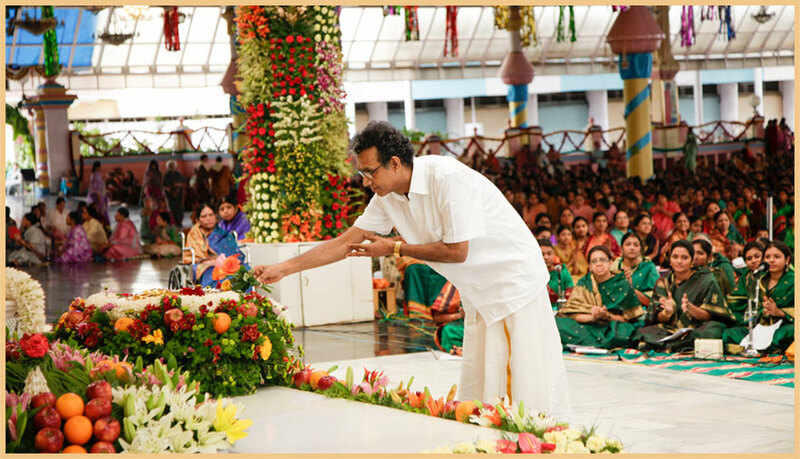 They were first presented at the lotus feet in the year of Swami's 90th Birthday on Aradhana Day 2015. Subsequent to this presentation, in answer to many devotees' queries, we had many live Radio Sai discussions about the making and the meaning of these compositions in our programs “Outside Inside Deep Inside” as well as “Morning Glory”. Presented below are edited excerpts of the first 'Outside Inside Deep Inside' discussion. In this, Radio Sai's C.G. Sai Prakash in conversation with Radio Sai's Bishu Prusty shares about the genesis of this beautiful endeavour. This is followed by a conversation with Mr. Balarama Chandran, who talks about his experience of being part of the team that made this presentation in the Sai Kulwant Hall on April 24, 2015. Bishu Prusty (BP): Sairam Sai Prakash. You have diligently worked behind the scenes and have been involved at every step of the making of the Pancharatna Kritis. Tell us the whole story of how these songs finally found their fulfilment and also how so many lives have found fulfilment through them. CG Sai Prakash (CG): So true. So many lives have found fulfilment through this endeavour. Well, almost immediately after 'Prema Pravaham' – the grand program on the evening of Swami's 85th Birthday, Prof. G Venkataraman was repeatedly saying that we should have an offering of traditional Carnatic music to Bhagawan. In fact he had been expressing this time and again whenever he saw Carnatic musicians in Puttaparthi. Once or twice when the legendary late Mandolin Srinivas was here, Sir discussed with him too and said, “We should do something on these lines for Swami”. So this was something deeply entrenched in his heart. When Swami suddenly left His mortal coil in April 2011, he now felt more strongly than ever that this should be taken up. The first thought that came to me was, “Who is going to be the Kaliyuga Tyagaraja?” And that's not easy. BP: It was to be done in Telugu? CG: No. It was always going to be a mixture of Telugu and Sanskrit. Tyagaraja Pancharatnas too are a mixture of both these languages. So now we needed a person who has not only commendable knowledge of music and literature but also has deep love for Bhagawan; it has to be someone who has seen Swami for decades and is fairly familiar with His life and message. The person has to be a poet too. In fact writing lyrics for a kriti is one step beyond poetry. Sanskrit and Telugu have this tremendous ability to condense a lot into one sentence. But we needed someone who is a master of both these languages. Now where do we go for a musician who can compose without lyrics? We had no clue who is going to do the lyrics but Prof. Venkataraman felt that we should find someone who can give a structure to the kritis and based on this framework the lyrics could be written and retrofitted in. So based on these discussions with Sir, I would make a list of points to be covered for each of these kritis. In fact each kriti had a theme of its own. The first one is about early life, His lineage, leelas, and so on. The second is about the divine aspect of Bhagawan – He is the maya manusha. The third is about the human aspect of Bhagawan – how He was so close to His students and gave Himself completely to them. The fourth is about His divine projects and activities. And the fifth is about His glory as well as His teachings. So for all of these kritis I had written about 15-20 points each – ideas which could possibly be included while writing the lyrics. After a lot of discussion, we went first to Mandolin Srinivas Sir. He was an epitome of humility – one of the greatest musical wizards the world will ever know. He had been coming to Swami since his childhood. There was always a radiance and a glow on his face. And when we mentioned to him that we want to do Pancharatna kritis on Bhagawan, his eyes just lit up! You will not believe it, within a month he came up with five tunes with pallavi, anupallavi and charanams. BP: Wow! So the tunes were done. CG: Yes. He had selected five ragas and created the tunes for the five Kritis. But now came the challenge. We needed someone who is not only skilled in music but also is scholarly in literature, and of course is a devotee of Bhagawan. Only such a person could write the lyrics for the pre-composed music. Mandolin Srinivas Sir is an instrumentalist. So his break-up of swaras was very nice compared to what a vocalist would have done. Therefore it was all the more challenging. A few big names were suggested but we felt it has to be someone who has been a devotee for years. Then out of the blue one of the brothers said, “Yes, there is a madam in the music college. She is a very good scholar and understands music too.” Something in me told me she is the one. I went to music college and met her. She was totally surprised. Her name is Mrs. Vasantha Lakshmi. 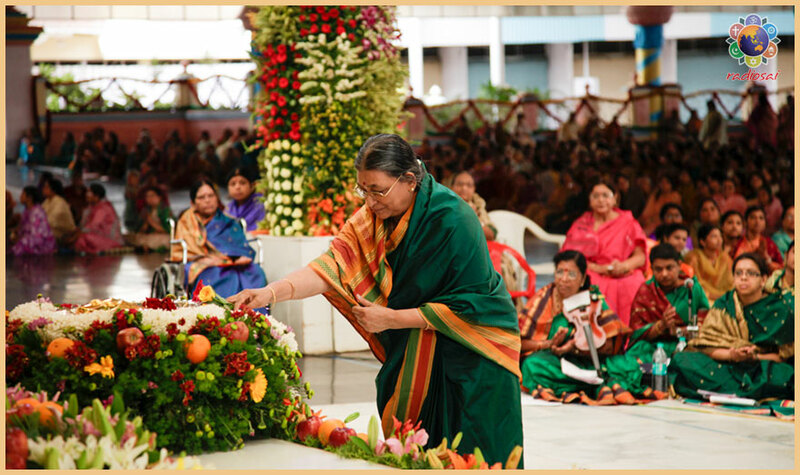 She is indeed a long standing devotee; she has been coming for nearly 30-40 years. Besides being a scholar in Telugu and Sanskrit, she has also done her Masters and Doctorate in Music. I said, “Aunty, Swami has chosen you!” I don't think we could have found anyone more suitable than her. I said, “I didn't come to you. This is purely Swami's prompting.” I really had no clue about her until that moment. Aunty then took up this project. She worked hard; she had to do justice to the tunes Mandolin Srinivas Sir had created. So on one hand she had to keep in mind the theme of the song and on the other hand she had to make sure the lyrics suited the tune of the composition. I knew it was no easy task. In fact I started wondering, “Swami, why are You putting us through such difficulties?” She took nearly 1.5-2 years to do this. It was extremely difficult. But somehow she finally managed to fit in the words. BP: So the five kritis were now ready! CG: Yes. We in fact did a rough recording and showed it to a few musicians for their frank opinions. See, this is where we should be really open to what Swami wants. So if you see our journey so far, we started with the basic structure of music and then got the lyrics. But now we had to take the lyrics and change the tunes accordingly. So it had to be a give-and-take between the lyrics and the tune. We did try this out. Still, we felt something was missing. Now Raj Kumar Bharathi Sir took the lyrics and started composing based on the ragas that came to him naturally. For instance, he had composed the second song in Mayamalavagowla raga. Mandolin Srinivas Sir too had chosen the same raga. But the way Bharathi Sir brought out the music was totally different. The moment he saw the lyrics for the first song which is like a grand opening of the Sathya Sai Avatar with the glory of His birth, early life and so on, he felt the raga should be Gambheera Nattai. CG: There are a lot of subtleties in these kritis. In Carnatic music, there is a concept called 'swaraksharam'. For example, in the second song, the first phrase is 'Sada Bhavayami'. The first word 'sada' has the notes 'sa' and 'da'. Now in the composition, this 'sa' in the lyrics corresponds to the musical note 'sa' and the syllable 'da' corresponds to the musical note 'da'. This has its own unique beauty. And these kritis abound in swaraksharams. Bharathi Sir is simply amazing and his love for Swami is so deep. His mastery of music is of course well known; we are nobody to even try to comprehend or comment on it. When we heard the compositions, we were totally bowled over. Madam herself agreed that if any poet was given a free hand, he or she would never have been able to write such concise charanams. Only because Madam had to fit in a lot of content and episodes from Swami's life into one or two lines, she worked really hard to adjust within the boundaries of the tune. This made her to seriously think of words which convey more than one meaning. She used only such words to do the charanams. So if you see, because of the first set of tunes, the lyrics became perfect. Then these perfect lyrics gave rise to the perfect tunes. This is how Swami works! Of course, I later sent the tunes to Mandolin Srinivas Sir too. I told him, “Sir, you had done the tunes but please listen to these new tunes. This is an alternate set.” When he heard them, he had tears in his eyes! He immediately called up Bharathi Sir and said, “You are the chosen one. These are simply beautiful. I will definitely learn these and come and play with you all in Puttaparthi.” That was the level of his commitment. See the heart of Mandolin Srinivas Sir! Actually when I sent him the first two kritis, he had just landed from an international trip. He did not even wash his face. He went straight to his laptop, downloaded and heard these. Immediately after this he called me and said, “It's beyond my words. This is definitely divinely inspired.” We never know how Swami makes things happen. Therefore ultimately these kritis were conceived by Swami, tuned by Swami and presented to Swami by Swami! That is all there is to it! BP: Beautiful! Thank you very much.